You know it’s the doldrums of August when Fox News is already hyping up the War On Christmas. Are you worried yet? You should be! 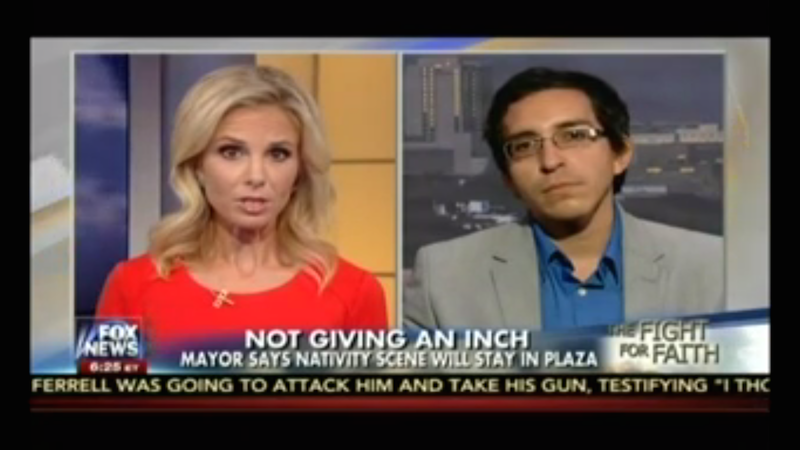 Fox & Friends co-host Elisabeth Hasselbeck recently highlighted a fight down in Belen, New Mexico over a controversial year-round nativity scene. Some locals of the town, whose name means “Bethlehem” in Spanish, want to see a plastic baby Jesus in the city’s local park to eternally celebrate Christmas; others, not so much, according to Media Matters. Hasselbeck spoke to Belen’s embattled Mayor Jerah Cordova, who is being pressured to take down the display down. It was usual Fox-iness. Mayor Cordova, lucky for Christmas, is not backing down. “Right now, we’re prepared to take this as far as we have to take it,” he said. All the way to... December?!? P.S. : Don’t you miss Elisabeth on The View? Sometimes, right? And then a shiver runs down your spine, just a small one.